Floor finishes is an incredibly large topic and cannot be covered in one article. There are so many variables and aspects of floor coatings but there is one common thread for using a floor finish and the cleaning of floors coated with a floor finish. So, this would be a good place to start on this subject. Why use a floor finish on a floor? Back in the 1970’s, Walter Hackett, the former Director of Research and Development from Purex Industrial used to say “Glossiness is next to Godliness”. How true this statement is! Anyone in the janitorial and cleaning maintenance industry fully understands what Walter Hackett meant and would agree with his saying. The vast majority of end user customers in both commercial and residential desire a High Gloss look to their floors. This is especially true in the commercial side of the cleaning business. 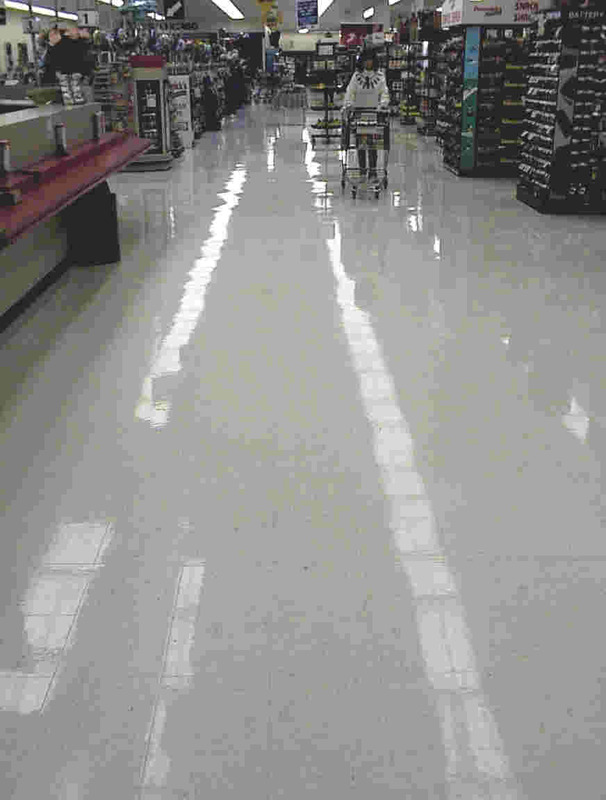 In fact the retail market is fully aware of this and understands the importance of glossy floors to their customers. 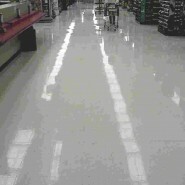 So, the vast majority of retailers demand a WET LOOK appearance to the store floors. Years of research and study have gone into development of floor coatings that deliver the High Gloss. So, why do we use floor finish on a floor? Yes, for looks but that is not the reason why floor coatings were developed. Beautiful looking floors were a discovered benefit to the reasons why we use floor waxes and polishes. The following is a brief chronological history of the floor coatings that were developed. Not a complete history but a basis for understanding how the floor coating industry developed through the years. Paste Wax – Waxes were made from a natural ingredient made from various plant and animal by products. Usually applied by hand and rubbed into the floor and was initially developed for wood floors which were the prevalent type of flooring at the time. Liquid Wax – Natural based ingredients but instead of a paste, the wax would pour and applied with a lamb wool applicator, making the application process easier, simpler and reduced labor. Liquid Wax with Carnauba – Carnauba was a wax derived from a specific Brazilian Palm Tree Leaves. This ingredient help improve upon the performance of the wax. There were 4 basic grades of Carnauba wax. #1 through #4. The #1 grade was extracted from the early young sprouting leaves. This was considered the finest grade and provided the lightest color. After all, nobody wants a wax that yellows. In 1935, SC Johnson & Son (commonly referred to as Johnson Wax) from Racine, Wisconsin found a new sustainable source of carnauba and established a plantation in Brazil as a renewable source. During this period, Liquid waxes were developed to also be applied with a wet mop. This increased the speed of the application process and reduced labor. Synthetic Wax/Finish – Liquid emulsion of synthetic wax, polymers, resins, etc. This developed again was an improvement in performance. These wax base products as well as their predecessors needed to be buffed to get a gloss but due to the softness of the coating itself, the wax required regular buffing to keep the gloss. Liquid Acrylic Metal-Interlocked Polymer Finish – This revolutionized the floor coating industry. It was far more durable then a pure wax based coating and could be made in a buffable, semi-buffable and a non-buff formula to meet the changing needs of the industry. Metal-Interlocking means nothing more than the coating could be scrubbed with a Detergent without any adverse effects tot eh coating. Prior to Metal-Interlocking of the polymers, a simple detergent or soap would remove the coating. High Speed Acrylic Floor Finish – Developed to handle and respond to the new to the market 2000 rpm propane burnishers. This was development came about out of the necessity for High Speed Dry Buffing machines. The Propane buffers delivered great gloss results with a faction of the labor it took to dry buff or spray buff with a 175 rpm floor machine. As stated above, there are many other developments, most minor or as impactful as the ones listed. Hopefully this gives you a perspective on the following subject – Why floor Coatings were developed. To protect the flooring – Flooring of all types will wear out from foot traffic as well as from cleaning maintenance procedures. Therefore the need for a floor coating is to protect the flooring from premature replacement. Easy of Maintenance – a bare uncoated floor is actually difficult to keep clean. Almost all types of flooring both Resilient and Non-Resilient are porous and will readily accept soil into the pores of the flooring. Once the soil is deeply imbedded into the pores, the floor is much more difficult to clean. Floor finishes, seals and waxes prevent this from happening. Beauty – As outlined above, this critical and desirable characteristic was realized as a result of the first two reasons we use a floor finish. Glossiness truly is next to Godliness. Just ask any end user. To support the importance of high gloss levels, look at the retail industry. It is important to retailers because throughout the years Progressive Grocer Magazine as well as other retail trade publications do surveys on why consumers shop at a certain store. Almost every year, shopping in a clean store is in the top 3 reasons why a consumer will shop at a particular store. This includes the floors and the overall cleanliness of the store including restrooms.Even if a floor is not extremely clean, as long as it has a High Gloss, it gives off the impression that the floor is clean. Seems odd but it is true. By no means is this article condoning soil floors for gloss only but this example is presented to support the desire for high gloss floors. Soiled floors create problems for the floor coating. So cleaning them is just as important for appearance as gloss. Cleaning floors coated with a floor finish not only improves the appearance of the floor and the overall hygiene of the building but it also prevents the floor finish from prematurely wearing out. When a floor coating wears out, it requires the renewal of the floor coating through either a deep scrub and recoat or a complete removal (stripping process) of the old floor finish and replenished with new floor finish. Both steps are costly from both a product and labor aspect. Proper daily cleaning in a commercial building including dust mopping and wet cleaning will extend the life of the floor finish on the floor. The correct use of a cleaner (Professional Grade Product), the cleaning frequency based on soil levels and the proper tools all combine to deliver the desired results. Proper cleaning maintenance will make that High Gloss floor look even better. Check back to the website for additional information on Floor Finishes, Seals, Coatings, etc. This is a robust topic due to the numerous subject matters on this topic. Future articles will include subjects like procedures, programs, labor, cost calculators, troubleshooting hints, etc.